“Users have been the driving force behind all development efforts at Synology. Through extensive communication with our users, we uncover their needs and respond swiftly with new innovations thanks to our strong software development team," said Derren Lu, CEO of Synology Inc. The Synology MR2200ac mesh router comes with a Qualcomm IPQ4019 quad-core CPU and tri-band Wi-Fi connectivity, allowing users to expand Wi-Fi coverage through flexible deployment. The mesh setup supports networks with ten routers total and Synology say that the software powering the experience works out the most efficient path for traffic. In addition, Wi-Fi connections and devices are managed via Synology's SRM operating system while additional settings and remote management can be handled through either a web interface or a dedicated mobile app. To give mesh network admins as much control as possible, Synology have updated their SRM platform to version 1.2. This software update offers more granular configurations, real-time traffic metrics, detailed traffic management, advanced web filters, and whitelisting features. It also promises better integration of third party databases, such as Google Safe Browsing and DNS/IP threat intelligence. 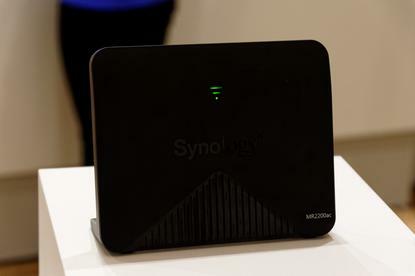 No word yet on local pricing but Synology expect to bring it to market in Q3.